Before we can learn a language, we must master its alphabet. Yet many Greek grammars spend little time teaching the symbols and sounds of the Greek alphabet. Failure to master the basics of a language -- its spelling and phonics rules -- will cripple our progress in mastering the whole language. This new edition of A Greek Alphabetarion has been thoroughly revised and reformatted to make it easier for parents to teach their children, and for older students to learn by themselves. A syllabary (practice blending consonants and vowels) and a chrestomathy (practice reading sample passages) have been added in this new edition. 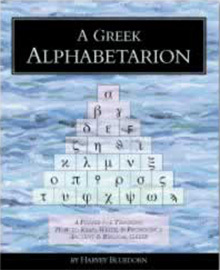 A Greek Alphabetarion teaches the Greek alphabet in alphabetical order, letter by letter, using a rhythmic cadence to aid the student's memorization. Then, it teaches the alphabet in phonetic order, classifying each letter by its sound. A Greek Alphabetarion helps the student step-by-step to master reading Greek before moving on to study Greek grammar. Suitable for all ages, child through adult, in homeschools, private schools, colleges, and seminaries. Designed to be accompanied by A Greek Hupogrammon: A Beginner's Copybook for the Greek Alphabet with Pronunciations by Harvey Bluedorn. I am extremely pleased with this introduction to the Greek language by Harvey Bluedorn. My 10-year started it this past semester, and has enjoyed his lessons in Greek immensely. Being independent in this subject especially thrills him. He reads the lesson, listens to the proper pronunciation of the Greek letter with the included compact disc, and then works in a copybook "A Greek Huppogram" (also by Harvey Bluedorn). We then review the material together. He has picked this up so quickly, no doubt due to the skill of Mr. Bluedorn in making this material understandable. The Alphabetarian is broken up into three parts--the basic Greek alphabet, Greek reading skills for advancing students, and the Greek phonetic system for advanced students. (We are still working on part one). The book is very well organized, and makes what I thought would be an extremely difficult language to learn approachable, uncomplicated, and fun. It's a great starter program for those interested in learning Greek, perfect for beginners or those in need of review. Have you ever wanted to learn Greek but found it hard to follow? Perhaps you should start here with this creative book. We learned our alphabet before we learned to read, so why should it be any different when learning Greek? The author not only shows you how to write each letter, but has provided a tape with correct pronunciation (a lifesaver in my book). I've reviewed many Greek language programs and have found several of them to be too difficult to get through. This book takes you letter by letter, step by step. If you've ever taken a foreign language, then you know that skipping steps is not an option if you want to actually learn something. I was pleased with the entire layout of the program and the price can't be beat. This would be an excellent choice for any homeschooling family! Learning Greek can be intimidating for many people because of the unfamiliar alphabet. In A Greek Alphabetarion, Harvey Bluedorn “prepares the student to read, write, and pronounce Greek” by giving him a strong background in Greek pronunciation and phonetics. Mr. Bluedorn begins the book with some introductory comments and a discussion of why one should study Greek. The New Testament of the Bible was written in Greek, and he feels that the reading of Scriptures in Greek is a key to a renewal and spreading of the Gospel throughout the world. Additionally, Greek sharpens the mind and helps one have a better sense of the Word of God. Developing a complete understanding of the Greek alphabet is the first step in learning Greek. In part one of A Greek Alphabetarion, Mr. Bluedorn teaches the alphabet in order with two pages per letter. A large diagram shows both the capital and small Greek letter. The pronunciation is given along with an English word or phrase in which the letter can be heard. The "quantity," long and short sounds of the vowels, is then detailed. A "key word," an English word containing the sound, is provided for the student to memorize. Next, a "For Your Information" section gives interesting tidbits that relate the alphabet to history or geography, for example. A review page and an exercise page appear after each group of six letters and include recitation of the alphabet, written exercises, numerical value of each letter, and a review of sounds. After completion of the basic letters and the obsolete letter “sampi,” rough and smooth breathers are explained, and then the more complex topic of diphthongs is presented. Part one ends with a final examination that tests knowledge of the Greek alphabet and diphthongs. Part two teaches the student how to sound out Greek words for successful reading. Transliteration tables show Greek phonograms and their corresponding English pronunciations. Next, a "Letter Card Activities" page offers several fun methods to help in learning. A Greek Chrestomathy, a group of Bible passages in Greek and English, follows. Part three, intended for older children, ages 10 and up, and adults, begins with a very detailed discussion of pronunciation. Mutes (consonants), semi-vowels, and vowels are explained in more detail with emphasis on how the lips, tongue, teeth, and throat work together to form the sounds properly. Review sheets, more letter card activities, and a final examination come next. The appendix has a general discussion of the history of languages and the different periods of the Greek language. Alphabetarion CD: The CD is included in a pocket in the back of the book. Harvey Bluedorn reads from the text and demonstrates the sounds with the fifty-seven racks on the disk making it easy to follow along with the activities in the book. An explanation of the Chrestomathy and readings of each selection concludes the audio. The recording is crystal clear. First, in learning Greek, one must learn the alphabet. To memorize the 24 Greek capital letters and 25 small letters is not hard. One can do it in a day or two. But Mr. Bluedorn is not satisfies with that as an introduction to Greek. He proceeds to teach the student the sounds so he or she can pronounce the letters, and finally the words, as you read. This gives one the proper foundation, for to learn the parts, the sounds, and the symbols prepares the student to thoroughly handle the Greek Language. So, he says, read your lessons out loud; engage your mouth, your ears, hands, and eyes. This is the old-fashioned way of learning. And it works! In our judgment this is an excellent way to study Greek. In fact, this reviewer plans to go through it in order to more thoroughly understand the Greek of the New Testament. . . Please do yourself a favor, learn Greek. It sharpens the mind. . . . The Greek Alphabetarion is also excellent. It is thorough, informative, and maintained my children's interest (range from age 6 to 17 both boys and girls). My kids fought over it several times. My kids might fight over the last scoop of ice cream, but not school books. They started leaving little notes for each other in Greek letters and became quite competitive. The ending selections from the Gospel of John were sufficient to encourage my older son to continue to study on his own after he completed the primer. I attended graduate school at the University of Notre Dame and graduated in 1989 and was the Director of Forensic (Speech and Debate) while a graduate student there. I have been a faculty member at St. Mary's College, IN; Eastern Illinois University, University of Illinois, Washington State University, and the University of Alaska Fairbanks prior to homeschooling my children. I have held administrative positions at the University level. I have worked in the area of Educational Support Materials for several principles textbooks in the field of Economics such as earlier editions Ruffin and Gregory and Parkin. I am not readily impressed by curriculum materials for either the University, Secondary, or Primary grades or for homeschool. It is not uncommon for me to re-write material my children's use. This is one of the few programs that I have bought that required NO re-writing work on my part. In fact, I've never had to re-write any materials authored by the Bluedorns that I have purchased. I have always received more than fair value. Do you wonder if learning Greek is worthwhile? Harvey Bluedorn answers, "Yes, Greek is worthwhile." Greek sharpens the mind, the language is useful for serving the Lord, and studying Greek is a preparation for revival. The next question: Can you learn Greek? Bluedorn answers once again, "Yes!" He describes A Greek Alphabetarion as "an easy start with Greek." Students of all ages will study each Greek letter, in both the book and the accompanying CD. Then, they will transliterate words, and read selected biblical passages. Part three, the Greek Phonetic system for advanced students (who are at least ten years old), includes mutes, semi-vowels, and a chart of Greek phonetics. An appendix, "The History of Languages," includes Japhetic languages, Hellenistic Greek, and biblical Greek. Harvey Bluedorn's newly revised A Greek Alphabetarion: A Primer for Teaching How to Read, Write, & Pronounce Ancient & Biblical Greek has been reformatted to serve as an even more valuable introduction to the study of Greek than an earlier edition. A true primer, the alphabetarion offers a well-organized and logically paced introduction for teachers and students of the Greek language. This expanded edition adds a syllabary (sample consonant-vowel blends) and a chrestomathy (sample reading passages) as well as an accompanying pronunciation CD. Homeschoolers pursuing the study of Greek will find this a valuable instructional tool that genuinely succeeds in its goal of helping students of any age master the reading and pronunciation of Greek before progressing to the study of Greek grammar. In the scene in which young Dorothy inquires how to start the journey to the Emerald city to see the Wizard of Oz, Glinda, the good witch of the North, advises her that it was best to start at the beginning. The premise of Mr. Bluedorn's Greek Alphabetarion is that for students to learn Greek, it is important to start at the beginning, that is, to learn the basics of the Greek language, its alphabet, its symbols and sounds, vowel combinations, and how the letters form syllables and words. Lack of understanding and mastery of these basics will impede mastery of Greek grammar and language. A Greek Alphabetarion is divided into three parts. Part one includes an overview of the Greek alphabet and introduces the signs and sounds of the alphabet. Following every four or six letters are review pages for the letters just covered and practice exercises in the writing and sounding of each letter. This part concludes by covering vowel combinations, or diphthongs. Part two is for the student who has learned the alphabet and now wants to learn to read and sound out Greek letters and syllables. Transliteration tables show the Greek consonants, vowels and diphthongs and corresponding English pronunciations. Also included are review activities and selected texts from the Bible in Greek with English translations in order to practice pronunciation. Part three is intended for older children and adults, providing a deeper understanding of phonetics and articulation, covering mutes, semi-vowels and vowels in more detail. Review sheets and other activities are also included. The appendix contains a brief discussion of the history of languages and the different periods of the Greek language. An added bonus is the pronunciation CD in the back of the book. A Greek Alphabetarion would be an excellent primer for children or adults who need the basics of the Greek alphabet before moving to more intensive study of Greek grammar and language. The book is appropriate for individual study or in a classroom setting. Recommended for college or university libraries whose institutions offer beginning Greek courses.